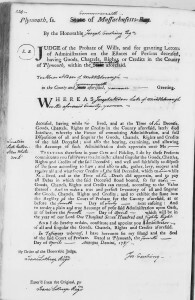 “Massachusetts, Plymouth County, Probate Records, 1633-1967” (this collection includes the alphabetical docket book indexes that list both the case number and the book and page numbers for the copy books). This collection is not searchable; thus, you will need to use the docket books to locate the records the same way you would do in the probate court. Like the previous collection, this also includes the original record files by case number, but it adds the copy books, which sometimes may include documents not in the case files. We are using Case #136 for Joseph Alden of Middleborough, who died in 1787, with corresponding copy book records from 27: 224 and 30: 373, 522. An intestate estate means there is no will (or that a purported will was not acceptable), and thus there are no instructions from the deceased about how to divide the estate. Therefore, it will be divided according to the law in effect in that jurisdiction. 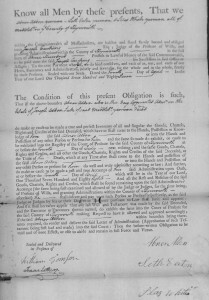 The Judge of Probate appoints an administrator who is charged with preparing an inventory of the real and personal contents of the estate, identifying all the legal heirs, seeing that the estate and family are taken care of while under probate, making trips to the court to file all the paperwork, paying and collecting debts, and making distributions as directed by the court. In this particular case, there is no “Letter of Administration” in the file, but a copy of the form is in book 27: 224. The administrator would be someone closely associated with the deceased, with the widow or eldest son first in line, but the family could ask the judge to appoint a more distant relative or even a non-relative they trusted. 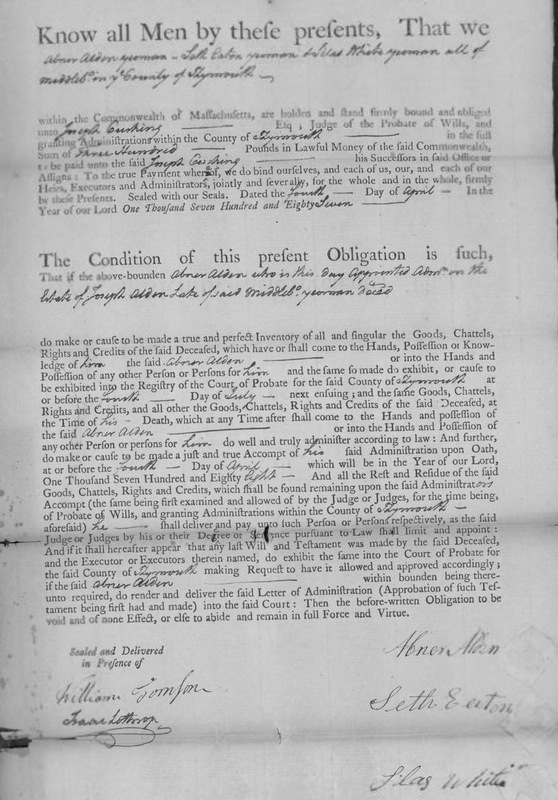 In our case it was almost certainly Joseph Alden’s oldest surviving son, Abner Alden of Middleborough, who was appointed administrator on 4 April 1787. 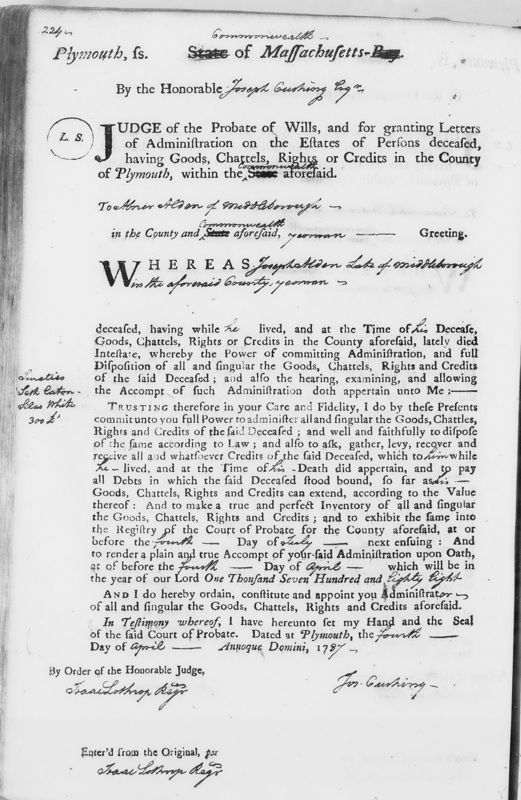 The letter gives deadlines for filing the inventory with the court (4 July 1787) and the full account (in one year). As insurance against malfeasance, the administrator was required to file a bond, with two co-signers. Here Abner Alden, yeoman, Seth Eaton, yeoman, and Silas White, yeoman, all of Middleborough, bound themselves for £300 on the same day that the letter of administration was issued. When everything was done to the satisfaction of the court, they would get their money back. Next, appointment of appraisers and the inventory. 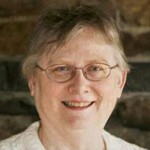 For example: “Probate Records 1778-1794 vol. 26-27.” The original microfilms contain two or three volumes of copy books on each roll, which you will need to keep in mind as you search for page numbers. For information about Joseph Alden, see Esther Littleford Woodworth-Barnes, comp., and Alicia Crane Williams, ed., Mayflower Families Through Five Generations, Volume 16, Part I, John Alden (Plymouth, Mass. : General Society of Mayflower Descendants, 1997), 378-81. Joseph’s oldest son, Ebenezer, had died at the age of 29 in 1773, and the second oldest son, Amaziah, was probably also deceased. I learn so much from your posts – many thanks! Jeff, glad they are useful.